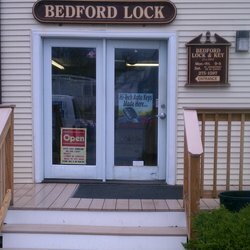 Bedford Lock & Key is a full service, local locksmith and security company who proudly has served residential and commercial customers for over 40 years. Established in 1969, we are a third generation, family owned and operated business. We provide professional locksmith sales, service, installation, electronic security, safe repairs and automotive locksmithing to residential and commercial customers. Our commitment has lead us to develop a network of ‘one stop’ service from installing a door with required hardware to a major build out. Whether your needs are high security, ADA compliance or simple functionality, Bedford Lock & Key can provide the experience, service or product. Our main goal is to make the customer feel secure. Bedford Lock & Key brings new levels of reliability and expertise to every aspect of your security and locksmithing needs. The complete satisfaction of all our customers is the cornerstone of our locksmith and security business. We are licensed, bonded and insured, and proudly serve Middlesex County.